Hemostatic agents help control bleeding by speeding up the body's own natural clotting process and by putting pressure on or inside the wound. They can be used in places where a tourniquet isn’t possible or in conjunction with tourniquets, israeli bandages, compression bandages, or other forms of hemorrhage control. They are also used to help control major bleeding when tourniquets have to be removed, i.e. when the time to reaching a hospital is more than 2 hours. Hemostatic agents are often used with major bleeding in the hips and shoulders where tourniquets can’t reach. Although originally designed for the military, a variety of products have now been released for civilian use. Hemostatic gauze plays an essential role in bleeding management, but for most bleeding it's overkill. The purpose of having military-grade clotting enhancement gauze in your first aid kit is to save a life when someone is bleeding out of control. For small and medium cuts, normal gauze and pressure will work just fine and save you money when you restock your kit. When a wound is bad enough to need hemostatic gauze the proper treatment is to pack the wound and apply pressure until the bleeding stops. Hemostatic agents come in the form of sponges, granules, and gauze. All of the products are effective, but the most versatile is z-folded gauze. The gauze is impregnated with a hemostatic agent which eliminates the mess of dealing with granules; it can be used to pack long or irregularly shaped wounds unlike the sponge; and it can wrap amputations, head injuries, or other areas where wound packing isn't an option. The z-fold works better than the old-style rolls because the rolls are hard to hold while unravelling. It keeps the gauze from falling in the dirt while you pack a wound. The z-fold gauze also has an x-ray detectable strip that prevents doctors from leaving any inside you by accident. 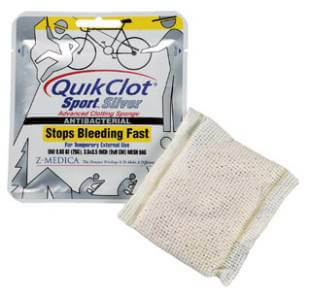 Quick clotting bandages, marketed as Quikclot, are used across the US military to stop major bleeding by clotting blood faster than the body can by itself. In the recent past, this hemostatic agent had a bad reputation because it used to rely on a chemical reaction that produced a lot of heat when it came in contact with blood. That all changed, and according to the company, Quikclot discontinued those products a few years ago when they discovered a better alternative. The new-and-improved version no longer heats up to clot blood, but instead it uses kaolin, a natural, hypoallergenic clotting agent that speeds up your normal blood clotting response. Quikclot has seen a lot of action in the U.S. military in both Iraq and Afghanistan, and it has proven to be a solid product. Celox uses a different clotting agent, chitosan as opposed to kaolin, and both work at about the same effectiveness. The active ingredient in Celox, chitosan, is derived from shellfish, but there haven't been any reports of Celox causing allergic reactions. Celox was approved by the U.S. Department of Defense and used during the war in Afghanistan. On a microscale, chitosan is a tiny bead with a high surface area. 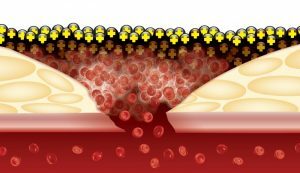 When exposed to blood, the beads expand and stick to each other creating a gel-like clot that stops blood flow. This substance is not normally a part of the human blood-clotting cascade but instead comes from the shells of shrimp. In order to be marketed in the United States, Celox was examined by the FDA and was shown not to cause allergic reactions in those with seafood allergies. Celox does not produce any heat when it interacts with blood. It is naturally broken down inside the body, but it is for external use only. Wound packing is considered external use. There’s a new player on the field of hemorrhage control. XGauze is a new, but surprisingly effective technology compared to other hemostatic agents like Celox and Quikclot. XGauze is packed with small absorptive mini-sponges that grow 10 times bigger on contact with liquid. You pack it in a wound just like you would do with Celox and Quikclot, but it stops bleeding faster than either. There are a few reasons why expanding micro-sponges have an advantage over traditional approaches to hemorrhage control. The oldest and quickest method used to stop bleeding is direct pressure to the wound site. Normally pressure is applied from the outside using the bone underneath to squeeze the blood vessels closed. The expanding microsponges apply pressure directly to blood vessels from within the wound. This is especially helpful for irregular wounds like gunshots and wounds that have no bone to compress against like torso injuries because the sponges expand to fill every corner of the hole, putting pressure evenly across all the broken blood vessels inside. XGauze does not use hemostatic agents to speed clot formation. In XGauze the extra surface area in contact with the blood makes it clot faster than normal gauze. In other words, Quikclot and Celox both have added ingredients that cause your blood to clot faster than normal; XGauze has the same effect, but it takes a completely different approach to the problem. As a disclaimer, XGauze is a fairly new product and hasn’t had extensive field testing like Quikclot and Celox even though the lab results look promising. 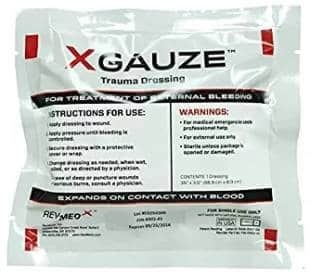 One potential disadvantage of XGauze is its limited usefulness for medium sized injuries, amputations, or other external wounds since the expanding gauze design is intended for wound packing. For amputations, a tourniquet is the best option, and a better, cheaper option for medium sized wounds is vetbond surgical skin glue. While hemostatic gauze can be used like a normal bandage these products are designed specifically for wounds that bleed enough to threaten your life, so in order to be as effective as possible we use a technique called wound packing. Hold the roll in one hand and use your thumbs to push the gauze into the cut or hole. Use as much gauze as you need until the hole is filled. Put pressure on the wound until the bleeding stops (about 3 minutes). Wrap the injury with an Israeli bandage. If this wound is on a limb, be careful that you don’t cut off circulation by pulling the pressure bandage too tight. Check circulation at the end of the arm or leg by pinching the finger or toe nail. The color under the nail will turn white as the blood is pushed out. When you let go the color should return to normal in less than 2 seconds. Certain real-world conditions prevent our bodies from creating blood clots as quickly as we would under normal circumstances. The genetic disorder hemophilia, blood thinners, and hypothermic bleeding conditions slow down or stop blood clot formation. Hemophilia is a blood clotting disorder that affects about 1 out of every 5,000 people. It is a genetic disorder that prevents blood clots from forming due to a decrease in the availability of certain clotting factors. For hemophiliacs, even small cuts can be serious. Those with hemophilia often take prescribed concentrated clotting factors to help their blood clot in case of an emergency. There is little evidence available to support the use of Quikclot or XGauze on those with hemophilia, but Celox works independently of the normal clotting mechanism and will work regardless of blood disorders. Celox is currently the only one of these hemostatic agents proven to work with hemophilia. XGauze may work with hemophilia because it works along two different mechanisms. The expanding sponges will still put pressure on the blood vessels and stop the bleeding, but XGauze will not cause the blood to clot if the natural clotting mechanism is broken. Quikclot works based on activating the body's natural clotting cascade, and it likely will not work on patients with hemophilia. I contacted Quikclot and was told they did not have information on the use of Quikclot with hemophilia. Hypothermic conditions increase the time blood takes to clot. Both Quikclot and Celox have been shown to work in hypothermic conditions. Less information is available on XGauze as it is still a new product, but it seems likely that XGauze would work in hypothermic conditions as well. Blood thinners like aspirin, warfarin, and heparin are common medications used to treat cardiovascular issues like heart disease. Both Celox and Quikclot have been proven to work when the patient is on blood thinners. It seems likely that XGauze will work with blood thinners based on its mechanism of action. When a blood vessel is cut or broken, a series of reactions is set in motion that causes platelets to break open and stick to the edges of the broken blood vessel. When the platelets break open, they also release chemicals that begin other blood clotting mechanisms. Blood clot formation is often referred to as a cascade because each broken platelet activates multiple other platelets. Those platelets each activate a bunch more platelets and so on. As a result, the clot forms faster and faster until the hole is filled. This is a very basic overview of the clotting cascade. See here for a more detailed description. While Celox works independently of the body's natural clotting cascade, Quikclot and XGauze work with the natural clotting mechanism to help form clots faster. Quikclot products contain a concentrated dose of a clotting factor naturally found in the blood that activates the clotting cascade. When the concentrated clotting factor touches the blood, it jump-starts the cascade. XGauze works in a similar manner, but it's not coated in clotting factors. When blood touches the sponge, the platelets know that there is a problem because the sponge material is very different from the normal blood vessels that platelets are used to. The platelets break open and begin the clotting cascade like normal, but since the sponge has a lot of surface area in contact with the blood, the cascade begins much more rapidly. If the wound is on a limb, elevate it to help control bleeding. Wrap the Quikclot/Celox package into the pressure bandage so that the doctor knows the exact treatment you used. If the wound is on a limb, use your knee to put pressure proximal to the wound while you pack it in order to help slow bleeding. "Quikclot® - How Quikclot® Stops Bleeding Fast–The Clinical Evidence". Quikclot.com. N. p., 2016. Web. 5 Oct. 2016. "Quikclot® - Military Hemostatic Agents For Clotting | Z-Medica". Quikclot.com. N. p., 2016. Web. 5 Oct. 2016. Kozen, Buddy G., et al. "An alternative hemostatic dressing: comparison of CELOX, HemCon, and QuikClot." Academic Emergency Medicine 15.1 (2008): 74-81. Zhang, Yin-Juan, Bo Gao, and Xi-Wen Liu. "Topical and effective hemostatic medicines in the battlefield." International journal of clinical and experimental medicine 8.1 (2015): 10. Gegel, Brian T., Paul N. Austin, and A. D. Johnson. "An evidence-based review of the use of a combat gauze (QuikClot) for hemorrhage control. "Aana j 81.6 (2013): 453-458. "Hemophilia A". National Hemophilia Foundation. N. p., 2014. Web. 31 Jan. 2017. "FAQ - Frequently Asked Questions About Celox." Celox Medical. N. p., 2018. Web. 20 Sept. 2018.